ISP-1 Sample Preparation, supplied complete with precision balance, syringe Pump and voice promting software. FAST – samples can be prepared in under 75 seconds. Sample details are automatically transferred to the RPV-1. Uses weight to weight data rather than weight to volume data to calculate concentration – avoids errors due to temperature/density. Automatic ASH & MOISTURE corrections to concentration. Uses AUDIO prompts to talk the operator through the essential preparation steps. Pre-programmed methods make preparation simple and straightforward. The software is updated regularly – taking into account new methods or customer specific requests. Therefore if your method is not mentioned in the above list then please contact us. Operator selects one of the pre-programmed methods, types in the sample ID & presses the “Prepare Solution” button. The iSP-1 then takes over and asks the operator for the vial. The iSP-1 uses a series of audio prompts to instruct the operator how to prepare the sample. Safety checks ensure that the vial is placed on the balance. ISP-1 then asks for the sample. The operator adds sample until the iSP-1 prompts them to stop adding sample. Finally the iSP-1 calculates the correct amount of solvent and dispenses it into the vial. Various safety checks throughout the process ensure the operators safety and prevent solvent being dispensed incorrectly. 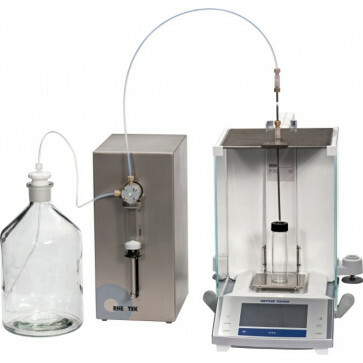 Sample information is stored and can be sent automatically to the RPV-1 Polymer Viscometer if required. The iSP-1 is supplied with a high quality MT balance. The iSP-1 pump is supplied with a tough chemical resistant coating. The pump can be disassembled for easy maintenance.